WHAT: After being rescued at the Quarter Quell by a secret resistance group, Katniss (Jennifer Lawrence) is transported to District 13, where President Alma Coin (Julianne Moore) intends to use her as the figurehead for the revolution. 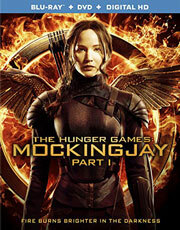 Katniss agrees on a few conditions – namely, that they rescue Peeta (Josh Hutcherson), who’s being tortured and used by the Capitol as the voice against the resistance, as soon as possible – and begins filming a series of propaganda videos intended to recruit soldiers for the war effort. WHY: One of the biggest problems you typically run into with two-part finales like “Mockingjay” is that the filmmakers are no longer forced to think economically in terms of what material is essential to telling the story. Though it made sense to split up the final installment of the Harry Potter series due to the sheer size of J.K. Rowling’s book, “Mockingjay” doesn’t have that issue, especially when “Catching Fire” (which is the exact same length in book form) was adapted just fine into one movie. Add to that the fact that “Mockingjay” is hands-down the weakest entry in the trilogy, and it was always going to be an uphill battle for director Francis Lawrence and writers Danny Strong and Peter Craig. There are some really powerful emotional beats littered throughout, and the rich cast of characters (both new and returning) help keep things from getting too boring, but it often feels like Lawrence is just twiddling his thumbs in fear of getting too far ahead, with most of the film spent setting up the next installment. It’s a necessary slog in order to get to the good stuff (and one that fans of the Harry Potter and “Twilight” series will be all too familiar with), but it’s a slog all the same. EXTRAS: In addition to an audio commentary by director Francis Lawrence and producer Nina Jacobson, there’s a making-of documentary titled “The Mockingjay Lives,” a behind-the-scenes look at Lorde’s curation of the soundtrack, a tribute to Philip Seymour Hoffman and some deleted scenes. 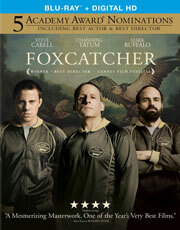 WHAT: Olympic wrestling champions Mark (Channing Tatum) and David Schultz (Mark Ruffalo) are courted by multimillionaire John du Pont (Steve Carrell) to train at his private facility as members of Team Foxcatcher in preparation for the 1988 Olympic Games, only for the partnership to end in tragedy. WHY: It’s easy to see why some people didn’t like Bennett Miller’s “Foxcatcher” – it’s a haunting, emotionally cold movie that keeps the audience at arm’s length the entire time. 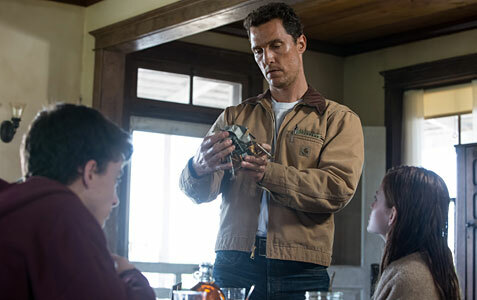 But that’s by design, not only because it reflects the temperament of its two lead characters, but because in doing so, Miller hopes to distance the film from the true-crime story on which it’s based. “Foxcatcher” feels like the kind of movie Stanley Kubrick might have made in another lifetime, meticulously and shrewdly assembled in such a way that every detail – from shot composition, to the dialogue, to the eccentricities of each performance – serves a purpose. All three main actors are fantastic in their respective roles, and in the case of Steve Carrell and Channing Tatum, it’s arguably the best work of their careers. Tatum plays Mark like a modern-day Lennie Small, a naïve and impressionable oaf who gets seduced into du Pont’s codependent web, while Carrell strikes a perfect balance between the wannabe coach’s ferocious ambition and childlike desire for approval. Without Mark Ruffalo as David, however, the movie wouldn’t work. He’s the soul of the film, the one person with something to lose that you actually care about, and it’s through him that “Foxcatcher” avoids becoming so detached that it shuts out the viewer completely. EXTRAS: There’s a decent making-of featurette, as well as a pair of deleted scenes. WHAT: When his daughter, Cassandra, is kidnapped from his truck during a routine stop at the local diner, Matthew (Ryan Reynolds) sees his marriage destroyed and the cops in charge of the investigation (Rosario Dawson and Scott Speedman) questioning his potential involvement. But after recent images of Cassandra are discovered online following eight years of dead ends, Matthew sets out to get his daughter back by any means necessary. WHY: There’s a lot of potential bubbling beneath Atom Egoyan’s “The Captive,” but it’s too often spoiled by gaping plot holes and a slightly disinterested approach to the material. Egoyan’s decision to structure the film using a jumbled chronology doesn’t enhance the narrative or ratchet up the suspense, but rather makes things unnecessarily complex for the viewer, who is forced to piece things together on his own. Cassandra’s fate and the villain’s identity is revealed so early on, however, that there’s no benefit to presenting the story in this manner. Ryan Reynolds delivers a solid performance as the troubled father more interested in finding his daughter than proving his innocence (not that he’s much of a suspect, anyway), but the rest of the cast isn’t as lucky, saddled with one-dimensional roles with little room to develop. (I’m still not sure what purpose Bruce Greenwood’s character serves, unless there was a bunch of footage left on the cutting room floor.) 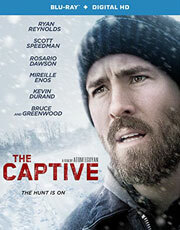 That’s not to say that “The Captive” is a total failure, but when compared to Denis Villeneuve’s similarly themed “Prisoners,” it lacks the cutting edge that made that film such a gripping and emotionally powerful child abduction thriller. EXTRAS: There’s an audio commentary by writer/director Atom Egoyan, a making-of featurette, deleted scenes and an alternate ending.